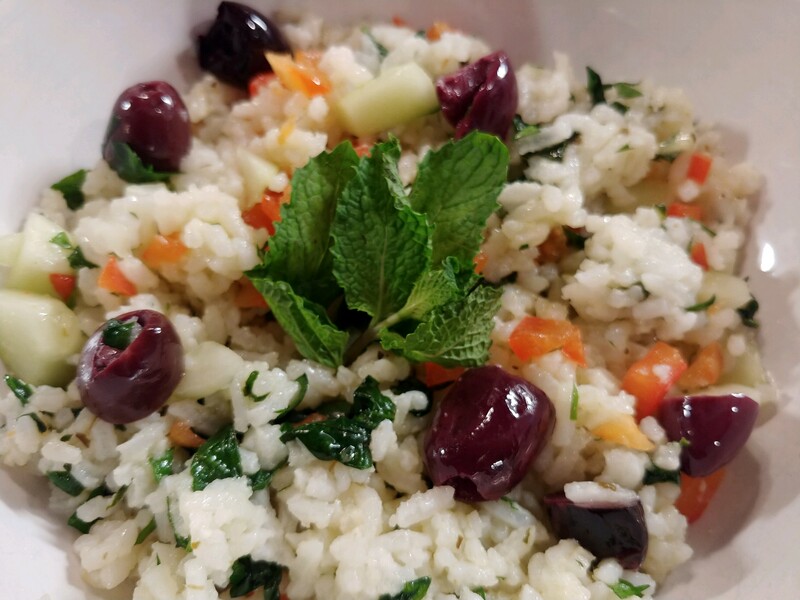 The secret to this flavorful salad is mixing the raw spinach leaves with the hot rice – the steaming rice sort of blanches the spinach leaves. They become brighter and more tender and are able to retain their flavor and nutritional value. Cut up all veggies while the rice is cooking because you’ll need the spinach leaves to be ready immediately after the rice is done cooking. Cook rice according to directions. In a large bowl, whisk lemon juice, olive oil, garlic, oregano, salt, black pepper, and cayenne. Add cooked rice to dressing and mix well. Add spinach, mix, and let stand for about 15-20 minutes, until rice has cooled a bit. What can we say about a beautiful, colorful, nutrient-filled dish that takes after its namesake (well, at least the beautiful, colorful parts)? This salad starts with a coleslaw base, but you can add everything you like and can only make it better! It’s so flavorful, you don’t need any fancy spices. When you see the bright colors and taste the sweet-sour dressing, you’ll be bowled over by Boulder Slaw! 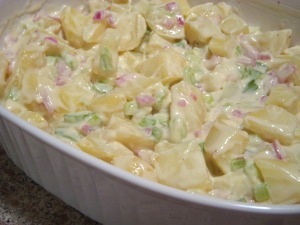 This is a vegan variation of my mother’s potato salad recipe, which was always very much in demand. Slice potatoes in half and place in a pot of boiling water. Boil until potatoes are tender but not mushy. Cool slightly; peel and slice into cubes. In a large bowl, stir together the first five ingredients. Add celery, onions, and potatoes; stir gently to coat. Chill. Garnish with a sprinkle of paprika and a parsley sprig. Rumor has it that southern-fried tofu will steal the show at a potluck. Try it and see for yourself. We credit Stephanie Tidwell, who hails from the South herself, for this recipe. 1. Cut tofu into slabs or strips. Mix all marinade ingredients; marinate tofu for at least 30 minutes. Cook pasta; drain and cool. Combine with chopped vegetables and herbs. Toss with your favorite oil and vinegar dressing (we like Newman’s Own Balsamic Vinaigrette). You may not think these ingredients work well together…but they do! This recipe is quick, simple, and yummy. Mix all ingredients together and chill. Southwestern Veggie Salad is a colorful side dish that’s perfect for a potluck or any occasion that calls for a quick recipe. You’ll make this salad again and again. Mix all ingredients together and chill. That’s it! This recipe can be served as a vegetable salad or as a pasta salad. It’s called 24-hour salad because the ingredients can be marinated in an oil-and-vinegar or Italian salad dressing for 24 hours. Or skip the marinade, toss all the ingredients with fresh-cooked pasta, and serve as a pasta salad. Either way, it’s delicious! As a vegetable salad: In a large, deep, glass bowl, layer the first seven ingredients in the order given. Add 1/2 tsp. salt to the dressing, pour over veggies, cover and refrigerate for 24 hours. Toss and serve. As a pasta salad: Boil 2 cups of your favorite pasta shapes until done. Drain and add to large bowl with all of the above ingredients. Mix and serve. 1. Place dressing ingredients in a small bowl. Stir with a whisk and set aside. 2. Combine slaw ingredients in a medium bowl. Pour dressing over slaw, tossing to coat.